Here is a very small door, really more of a doorway! Taken in August 1927 on holiday in Whitley Bay Gordon, Jack and Nancy Dinnis have built a wonderful sandcastle with a door at the bottom! It looks like a pretty chilly August day, they’re wearing coats, but it looks like they are really enjoying this family day out. Tomorrow will be a Church door. 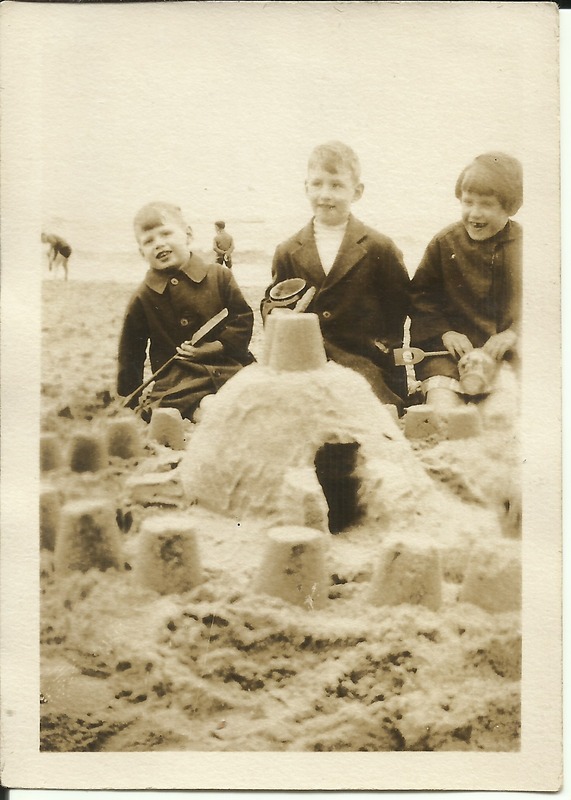 This entry was posted in Gordon Charles Dinnis, Holidays, Jack Douglas Dinnis, Nancy Dora Dinnis and tagged Advent, advent calendar, sandcastles, Whitley Bay. Bookmark the permalink. They do look like they’re having fun! And I had to giggle at the coats, especially when I saw that the photo was taken in August. Ah England! Hehehe, yes, summer holidays, get your winter coats out! It’s quite warm at the moment, I’m guessing no snow for Christmas this year!